In the early 1980s John and Erica Platter, creators of the eponymous Wine Guide, bought a farm on the side of a mountain called Avonduur. It was renamed Delaire, French for ‘from the eyrie’ as it looked down over the most amazing scenery. In the mid 1980s, I attended a charming ceremony in the founding cellar at Delaire during which the Rev Douglas Lawrie of the then NG Sending Kerk in Franschhoek invoked God’s blessing on Delaire and the new cellar. Douglas was the subject of much admiration in Franschhoek, he read Larousse Gatronomique in French and was known to turn out a champion dish of Lapin a la Moutarde au four. Little did the Rev Douglas know what he was doing then could bring about the modern era of this fine Estate, now known as The Delaire Graff Estate, one of the country’s leading wine, food, art, hospitality and Spa destinations. 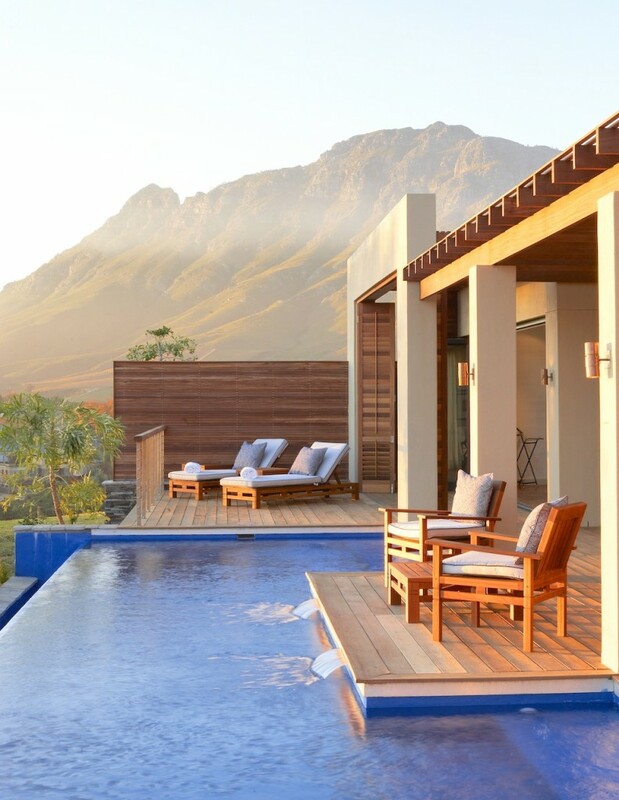 The Delaire Graff Estate is situated on the yoke between Botmaskop which broods over the Estate from the South, the majestic massif of the Simonsberg to the North East, and further to the East the Groot Drakenstein Mountain with its impressive Dragon’s Tooth. The Estate is on the apex of the Helshoogte Pass overlooking Banghoek, thus named for the fear of travellers, in the early days, of the possibility of encountering one of the famed Black Maned Cape Lions. It is close to Stellenbosch, in the heart of one of South Africa’s most historic and prestigious wine appellations, founded by Governor of the Cape, Simon van der Stel in 1679. Van der Stel, as is so eloquently told in C Louis Leipoldt’s Three Hundred Years of Cape Wine, made a huge contribution to the wine industry through his a sound knowledge of viticulture and the art of wine making – fostering a tradition that has grown from strength to strength through the past 354 years. 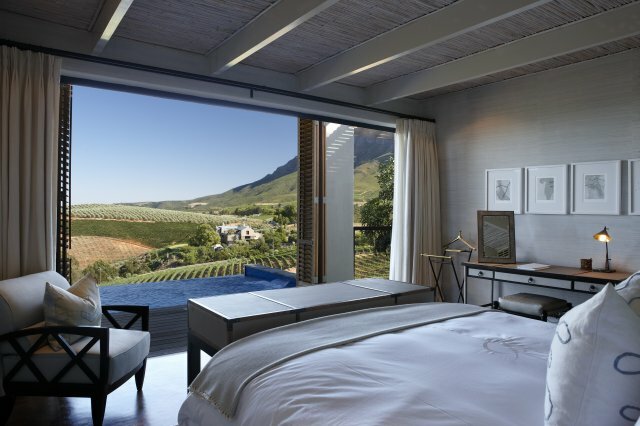 The Delaire Graff Estate was acquired in 2003 by Laurence Graff, Chairman of Graff Diamonds International, who went about with dedication and purpose to transform it into South Africa’s most desirable art, hospitality and wine destination. 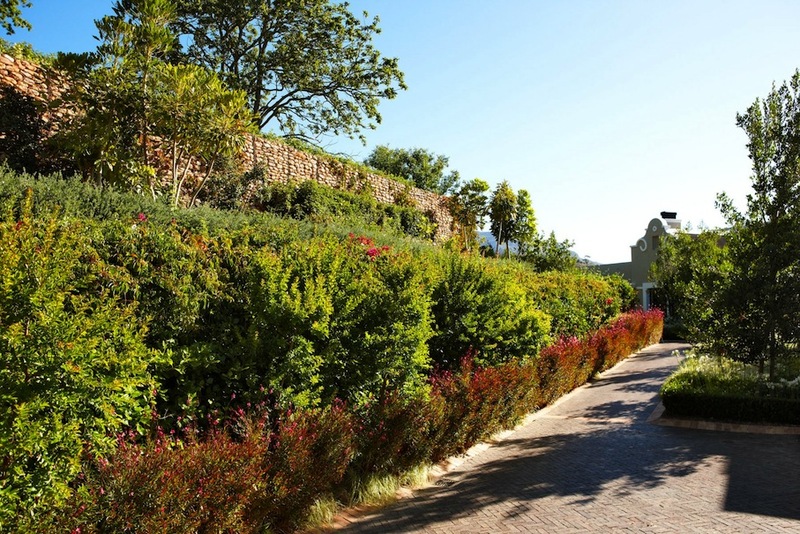 The Estate’s architect Derick Henstra has created cutting edge buildings while well known South African Horticulturist Keith Kirsten has surrounded the buildings with dramatic and sympathetic plantings. The Lodges, designed by South African Pierre Bories since 1987, Managing Director of Palm Architects, based in the South of France. He has a unique multi-cultural approach to architecture, so beautifully interpreted at The Lodges where Cape Dutch meets Africa. At the helm of the winery is Morné Vrey, a humble passionate winemaker who is making some sublime wines. 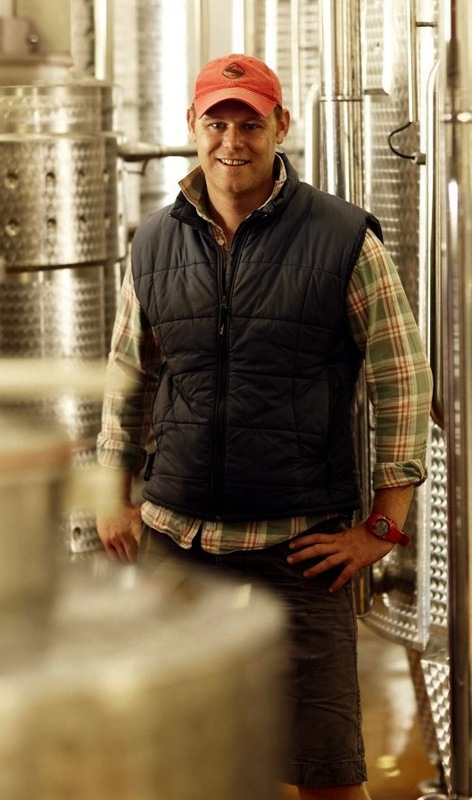 Former assistant winemaker at Hazendal Estate, Morné has extensive experience in the winelands of the worlds having worked harvests in place as far flung as France, Germany and New Zealand. This experience is put to good use to create a succession of superb wines, using superior fruit from Delaire Graff’s own and contracted vineyards in other wine regions. With one of the most advanced cellars, operational since the harvest of 2008, at his disposal, the Estate can be comfortably rated as one of the top ten wine producers in South Africa. From the outset wine quality has been superb and Delaire has achieved a stellar rise. Highlights have included winning significant awards for two successive Sauvignon Blanc vintages: with the Sauvignon Blanc rated Five-Stars for the Sauvignon Blanc Challenge in 2009, and the Coastal Cuvée Sauvignon Blanc winning the prestigious Old Mutual Trophy for Best on Show in 2010. In addition, the 2008 Cabernet Sauvignon Reserve received the significant John Platter Five-Star rating, one of the most impressive awards a wine can ever win. The Delaire Graff Restaurants – gourmet offerings since 2009. The restaurant offers superb service both on a terrace, under a canopy of oaks, overlooking the valley below or indoors which is decorated with Laurence Graff’s eclectic collection of South African art. Delaire’s experienced wine staff are able to take guests through the well planned wine list to ensure that every one of the dishes on the menu has the perfect wine pairing. Of the most enchanting attributes of the Estate are the sweeping views across stunning vineyards and mountains towards Stellenbosch, and across the Peninsula to Table Bay and the iconic Table Mountain. The silence and sense of privacy is evident in the ten beautifully decorated lodges, each with their own private plunge pool, which invite complete relaxation in an idyllic setting. Art and design, fabulous food and award-winning Delaire Graff Wines in the Indochine Restaurant, and a world class Spa, which offers a range of products and exclusive treatments. Vineyard walks, wine tastings and visits to the historic towns of nearby Stellenbosch and Franschhoek are available to visitors. In the The Wine Lounge, the range of Delaire Graff wines is presented by knowledgable wine ambassadors who are equipped to advise customers about the styles and current vintages available for purchase. Again visitors sit amongst Laurence Graff’s eclectic personal art collection. 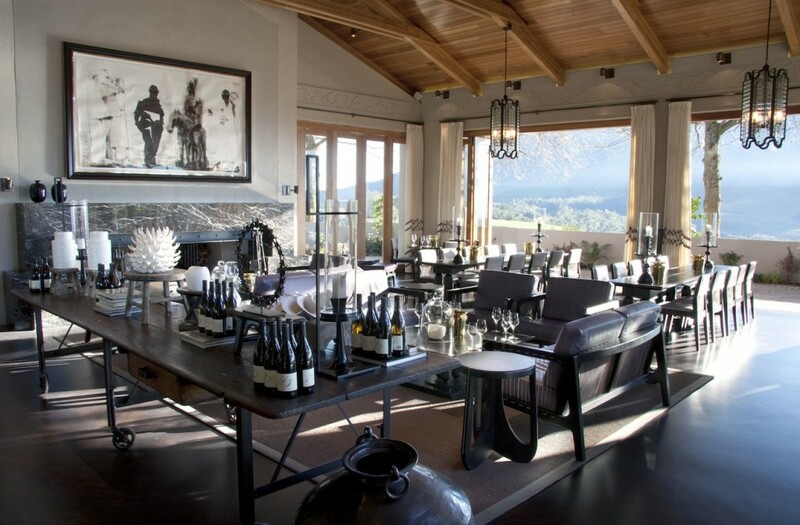 The wine lounge features both indoor and outdoor seating for tastings and for a sundowners before a dinner at one of the Estate’s restaurants. Group tastings and cellar tours can be arranged, and require reservations ahead of the visit. The Estate has one of the most eclectic contemporary art collections, making the art alone a reason for a visit. 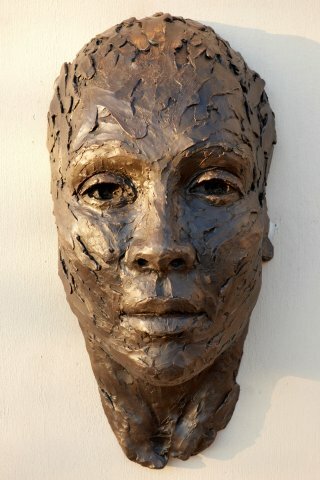 The collection has been a lifelong passion of Laurence Graff, who continues to discover promising South African artists. The interiors at the Estate have been designed around some of the pivotal works on display, such as the William Kentridge-inspired boldly curvaceous tangerine leather banquette in the Delaire Graff Restaurant. 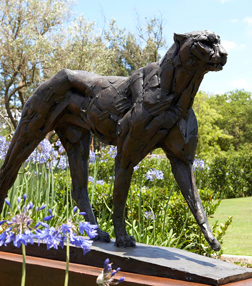 South Africa’s diverse heritage is reflected in the art at the Estate: Lionel Smit’s African Woman in the Tasting Lounge echoes the subtle palette of the natural hues used in the sophisticated setting, while signature Dylan Lewis cheetahs grace the Estate’s landscape. Works by Deborah Bell, Sidney Kumalo, Fred Schimmel, Durant Sihlali and Cecil Skotnes adorn the walls, while guests at the Lodge will particularly enjoy Stephane Graff and the intensity of Ndikhumbule Ngqinambi’s work.